This has been one exciting week. Nothing like a new book release to have all my friends come out, send congratulations, and tell their friends about my new book. I am so very grateful for that. For authors, release week leaves us to the point of almost walking in our sleep–it’s exciting, but completely exhaustng. There are so many things for authors to do All At The Same Time, and trying to keep up makes us long for the kind of promo teams James Patterson and Stephen King employ. But most of us do not make the kind of revenues those bigname authors get, so we happily jump in and change hats to whatever other job(s) we have to do besides writing. Even more exciting, to celebrate the release of ABSTRACT ALIASES, my publisher has discounted COUNTERFEIT CONSPIRACIES to just 99¢ until Sunday night. 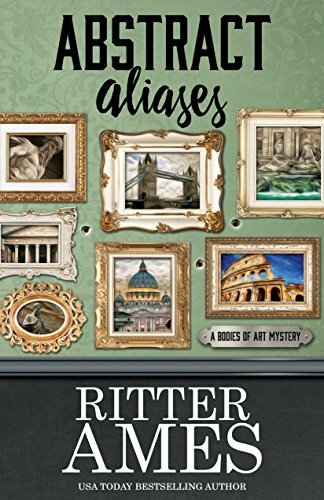 This is the first time Henery Press has discounted one of my Bodies of Art Mysteries, so if you haven’t started the series yet, but want to, please grab a copy before the price goes back up. And please tell your friends. I love when my readers can get a bargain! Quite honestly, I’ve had so much fun with this new book. Gigi Pandian and I co-hosted an event this weekend where we didn’t talk about our books, but instead showed pictures and gave info about the places and art and history associated with our respective new titles. How fun is that, right? But I’ve fallen behind in my reporting tasks and fun duties. If you look on the banner above, I’ve not only added a webpage where you can download a coloring page copy of ABSTRACT ALIASES and Gigi’s new release MICHELANGELO’S GHOST, but I’ve also added a second page of downloadable coloring pages for places in my Bodies of Art Mysteries. I’ve also added an ABSTRACT ALIASES link on my Chapter Excerpts page if you’d like to read the early chapters of the new book. You can find that Chapter One Excerpt by either clicking on the tab in the black navigation bar under my top banner, or just click the link below. characters globetrot from London to Rome to Cologne to Baden-Baden, then back to London. All in just a couple of days. Exciting, huh? But not nearly as exciting as again coming face-to-face with the bad guys they’ve been looking for the past few months. 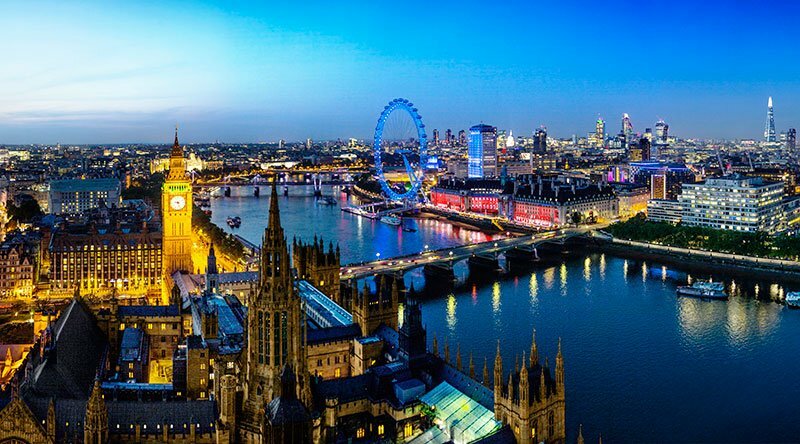 And that surprise comes in the most unlikely place–when they’re surrounded by a 100,000 or more Londoners waiting for a holiday extravaganza. I won’t spoil things by adding too much detail here for anyone who hasn’t yet read ABSTRACT ALIASES, but I promise surprises at every turn. Laurel’s & Jack’s mission doesn’t keep them from doing a little art sightseeing however, and these are some of the images they saw. 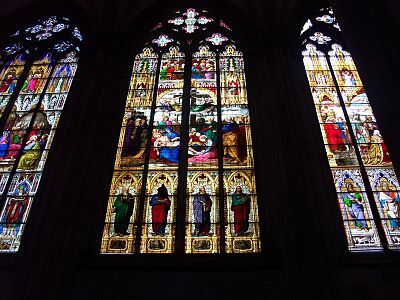 To the left is just a small sample of the stained glass windows in the ginormous and art filled Cologne Cathedral in Cologne (or Koln), Germany. 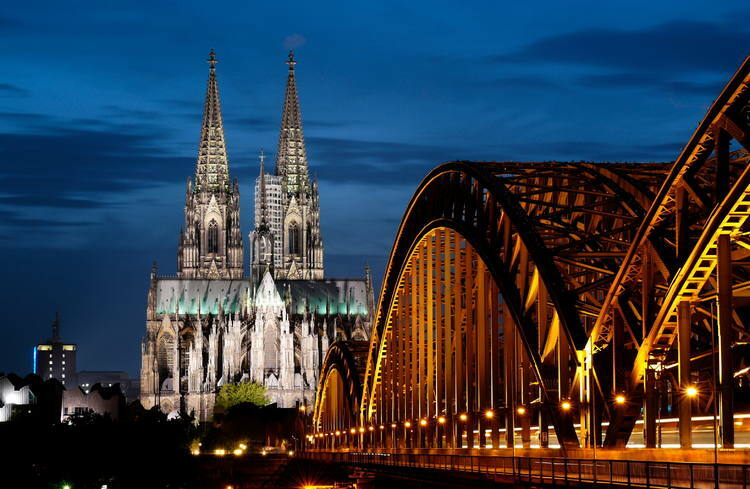 You can see a picture of the entrance to Cologne, with the cathedral in the distance, in the next picture. 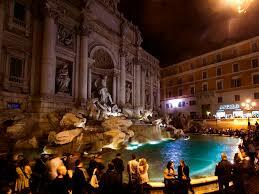 Below is a night shot of the Trevi Fountain in Rome the way Laurel & Jack saw it. And below is a larger shot of the fresco Sibyls magnificently designed and painted by Renaissance artist Raphael in the Santa Maria della Pace. 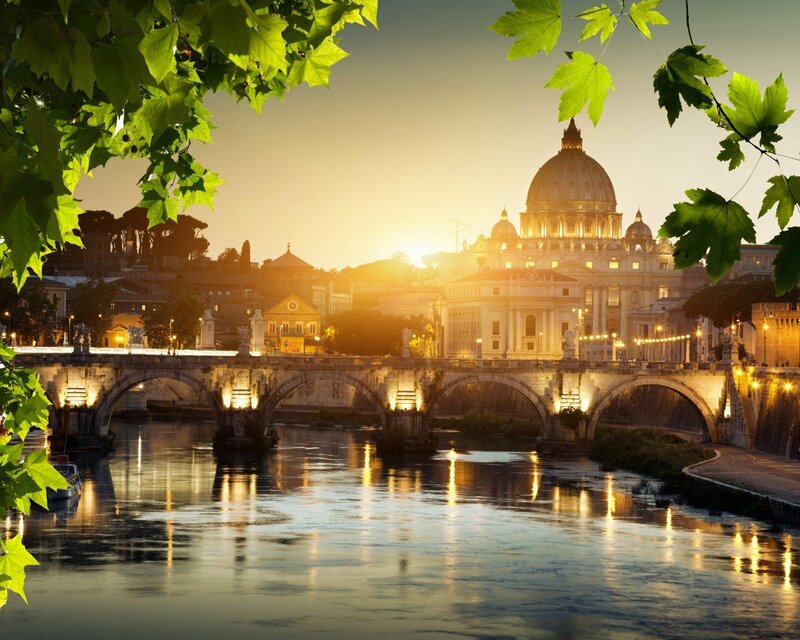 The last picture is a sunrise in Rome. I’m ready to go on another European vacation now! ← Previous Previous post: Come Join in for the Fun and Celebration!